We've talked before about how to wear sequins during the day. The key is pairing the sparkle with something utilitarian and absolutely casual - like denim or chambray - or both! A dressy sequin top looks infinitely more laid back tossed on over a chambray shirt and blue jeans. I like to pop on a blazer to create an additional layer that mutes the sequins. Chunky boots instead of heels also help edge this outfit from dressy to dressed-down; I think a pair of Converse would also do the job! Do you wear sequins during the day? How to you keep them casual? Of all the crazy looks I've tried, I've never done daytime sequins. You make it look so easy! I gotta try it! Yessss have that top and love what you've done with it!! That look is amazing! It is very bold! This is something I would never ever pair and I have never worn sequins in daytime. 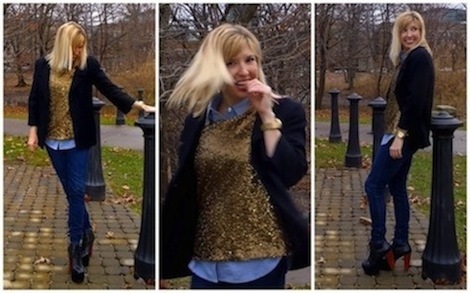 Thanks for tips how to wear sequins daytime. Now I have to go buy me something sequined.... You're looking loverly, lady! I think I'm the only gal who doesn't own sequins this season! I need to get some. You look so cute! A Stylized Hysteria, WhatLolitaEats, ChillAirnadPerfume - YES! I'd love to see the sequin looks you put together!! 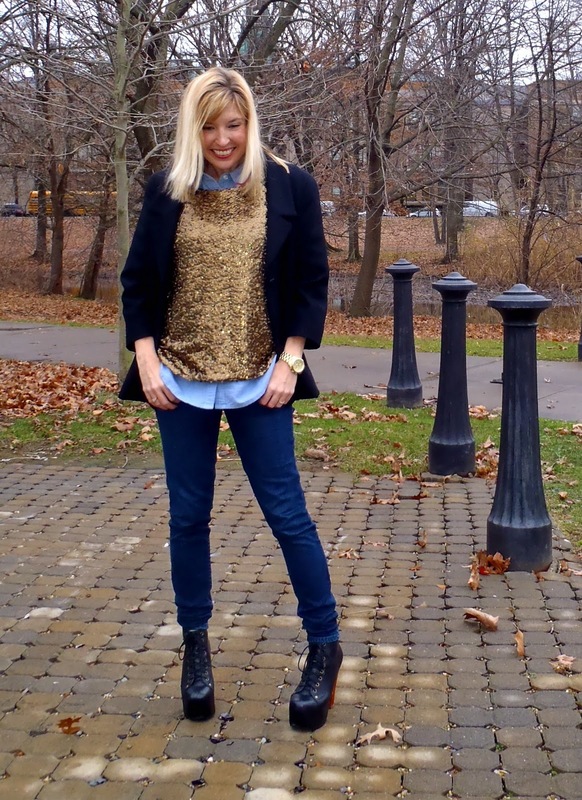 Ooooooh sequins and chambray is a pretty combo! I actually don't own anything with sequins, which is a shame. Are you going to the blogger holiday mixer this weekend?